I am the no prego pro, infertility warrior, bunless oven, can’t-make-a-baby veteran. It has taken six years and tens of thousands of dollars to achieve this distinction, and more specifically, 1,611 prenatal vitamins, 78 fertility drug injections, 55 ovulation detection tests, 40 blood draws, 33 ultrasounds, 16 pregnancy tests, and 11 embryos to confirm it. Still, throughout this not-so-fun numbers game (I always thought that procreating was supposed to be much, much more enjoyable), I have tried very hard to look at the lighter side of our struggles to conceive: Betting to see whose sperm count is higher and performing a strip tease in a hospital room are not things that I ever thought I’d be part of, yet here I am, willing to disclose the details of some very intimate incidents. Whether a couple needs two tries to get pregnant or two hundred, most can relate to calculating menstrual cycles and trying to decipher ovulation test sticks. And there can be plenty of funny incidents and awkward and absurd moments along the way, whether trying to get pregnant involves candlelight and Barry White or Petri dishes and blastocytes. 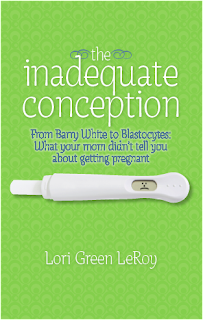 The Inadequate Conception tells the author’s and others’ real-life stories of trying to find two blue lines on a pregnancy test.